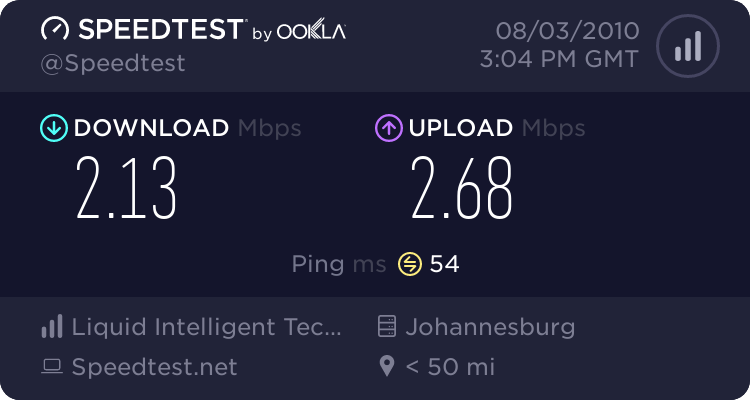 When Neotel first approached me about upgrading my connection to a 2Mbps line, for free, I wondered what the catch was. I was offered their WiMAX solution because a) I lived in an area with capability and b) my 24-month contract was up for renewal in a few months. I know this has been rolled out to a certain amount of users, which will explain the speed I am currently getting. While I am very happy about it [okay, majorly thrilled], time will tell if these speeds will last. How is it working now? Do u still get the same speeds ? Hi Ricardo. I get just over 2Mbps, so slightly better than what I’m supposed to, and rarely have issues. I’m very happy with Neotel’s WiMAX service.